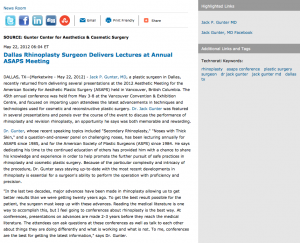 Dallas, TX — Jack P. Gunter, MD, a plastic surgeon in Dallas, recently returned from delivering several presentations at the 2012 Aesthetic Meeting for the American Society for Aesthetic Plastic Surgery (ASAPS) held in Vancouver, British Columbia. The 45th annual conference was held from May 3-8 at the Vancouver Convention & Exhibition Centre, and focused on imparting upon attendees the latest advancements in techniques and technologies used for cosmetic and reconstructive plastic surgery. Dr. Jack Gunter was featured in several presentations and panels over the course of the event to discuss the performance of rhinoplasty and revision rhinoplasty, an opportunity he says was both memorable and rewarding. Dr. Gunter, whose recent speaking topics included “Secondary Rhinoplasty,” “Noses with Thick Skin,” and a question-and-answer panel on challenging noses, has been lecturing annually for ASAPS since 1985, and for the American Society of Plastic Surgeons (ASPS) since 1984. He says dedicating his time to the continued education of others has provided him with a chance to share his knowledge and experience in order to help promote the further pursuit of safe practices in rhinoplasty and cosmetic plastic surgery. Because of the particular complexity and intricacy of the procedure, Dr. Gunter says staying up-to-date with the most recent developments in rhinoplasty is essential for a surgeon’s ability to perform the operation with proficiency and precision. “In the last two decades, major advances have been made in rhinoplasty allowing us to get better results than we were getting twenty years ago. To get the best result possible for the patient, the surgeon must keep up with these advances. Reading the medical literature is one way to accomplish this, but I feel going to conferences about rhinoplasty is the best way. At conferences, presentations on advances are made 2-3 years before they reach the medical literature. The attendees can ask questions at these conferences as well as talk to each other about things they are doing differently and what is working and what is not. To me, conferences are the best for getting the latest information,” says Dr. Gunter. Also having served as Co-Chairman of the 29th annual Dallas Rhinoplasty Symposium in March, Jack Gunter, MD says regular participation in events like the ASAPS conference is a beneficial way for attendees to hone their skills and refine their understanding of the principles of aesthetic and reconstructive procedures such as rhinoplasty. He says playing an active role in the surgical community allows doctors to share experiences and cultivate the future of cosmetic medicine in a way that fosters attention to patient care and effective results. “Listening to presentations by other surgeons can often result in a new idea for the listener. If it sounds good and seems safe, the listener can try carefully and slowly to introduce it into his practice. If it works, he can then present it at a meeting and the word will start spreading,” he says. A graduate of the University of Oklahoma School of Medicine, Dr. Jack P. Gunter completed his Plastic Surgery residency at the University of Michigan, his residency in Otolaryngology at Tulane University EENT Hospital, and a Fellowship in Facial Plastic & Reconstructive Surgery at Mercy Hospital in Pittsburgh. He is dual board-certified by the American Board of Plastic Surgery and the American Board of Otolaryngology, as well as a Fellow of the American College of Surgeons. Dr. Gunter currently serves as a Clinical Professor in both the Department of Plastic Surgery and the Department of Otolaryngology-Head and Neck Surgery at UT Southwestern Medical Center in Dallas. He is a founding member of The Rhinoplasty Society, Inc. and a member of the American Society of Plastic Surgeons, the American Society for Aesthetic Plastic Surgery, the American Academy of Otolaryngology-Head and Neck Surgery, and several other professional organizations. Dr. Gunter has also received countless distinctions such as D Magazine’s “Best Doctors in Dallas,” the ASPS Presidents Award, the Simon Fredricks Award, and Best Doctors in America. Located at 8144 Walnut Hill Lane Suite 170 in Dallas, TX, the Gunter Center for Aesthetics & Cosmetic Surgery can be reached at (214) 369-8123. Dr. Gunter and his team can also be contacted online via the websites www.rhinoplasty-usa.com, www.gunter-center.com, or the Gunter Center for Aesthetics and Cosmetic Surgery Facebook page.